CHANDLER, AZ (Feb. 18, 2015) – With the first-edition supply of Return to Order: From a Frenzied Economy to an Organic Christian Society depleted, a second printing of 20,000 hardcover copies is almost complete. The highly lauded book centered on providing solutions to address the nation’s social and economic chaos has earned nine awards and sold more than 30,000 copies to date, while continuing to receive accolades. “A clear indictment of our mad rush to obtain more and more stuff, regardless of the cost to society, or families, and even ourselves. While the book’s central argument will make more sense to someone who has a background in Christian theology, this book is also of value to anyone who sees the inherent problems in a culture whose only tenets appears to be, “MORE!” and “NOW!” said one reviewer in December 2014 on Amazon.com. 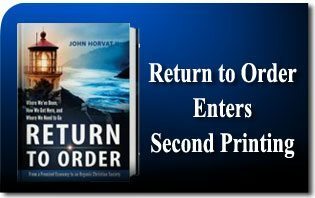 Return to Order has received dozens of endorsements from leading academic political, military and religious leaders, with numerous readers describing author John Horvat II as one of America’s great thinkers. “Anyone who considers the ongoing public debate as superficial… should study Mr. Horvat’s Return to Order. It is to be hoped that this book reaches a large reading public and will have an impact on public policy, theoretical debates and personal decisions alike,” said Gregor Hochreiter, former director of the Institute of Applied Economics and Western Christian Philosophy in Vienna, Austria. Horvat draws from our nation’s rich Christian past and 20 years of research to explain the correlation between the economy, faith and moral values in Return to Order. Without relying on statistics, formulas and economic indicators, he shows how society’s obsession for a secular, materialistic culture is causing social and psychological emptiness and economic ruin. “All of these dynamic elements — church, community, family and private property — form an invaluable human infrastructure that actually provides the moral capital, psychological health and stability upon which even our modern economies must be built,” writes Horvat. Return to Order ranked number one on Amazon/Kindle in four countries and also has a 4.5 star rating on Amazon. “I’m giving it 5 stars and recommending it for everyone who cares about our society going down the tubes, both financially and morally,” wrote Lantana Al, Amazon top 500 reviewer. Horvat, who is also vice president of The American Society for the Defense of Tradition, Family and Property (TFP), continues sharing his message in 2015, speaking to groups across the country. He has given presentations in more than 60 American cities as well as in Europe and has participated in more than 200 media interviews since Return to Order was first released in 2013. Horvat has also published hundreds of articles that have appeared worldwide, including in The Wall Street Journal, FOX News, The Christian Post, The Washington Times, ABC News, C-SPAN, American Thinker, Spero News and TheBlaze.com. Return to Order: From a Frenzied Economy to an Organic Christian Society—Where We’ve Been, How We Got Here, and Where We Need to Go is available in hardcover (ISBN: 978-0988214804; 400 pages $21.95 U.S.), and eBook (ASIN: B00B5HED8W $4.95). Both can be purchased at www.returntoorder.org. For more information or to request an interview with Horvat, please call Linda F. Radke at 480-940-8182, or email fivestarpublications@gmail.com.